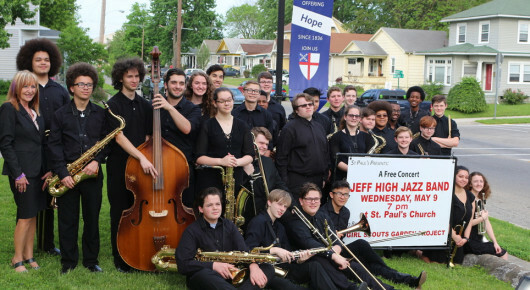 The Jeff High Jazz Band will present a concert on May 9nd to benefit the Student Food Pantry at Jeffersonville High School. The concert is free. A free-will offering will be received. 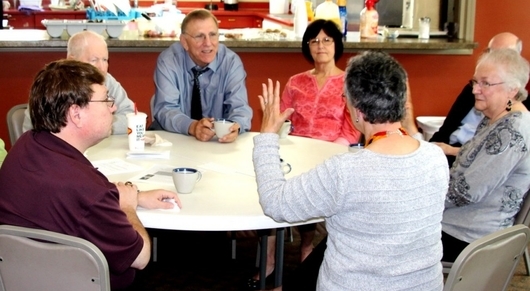 At St Paul's we use Discovery Days conversations in making important decisions as a congregation. 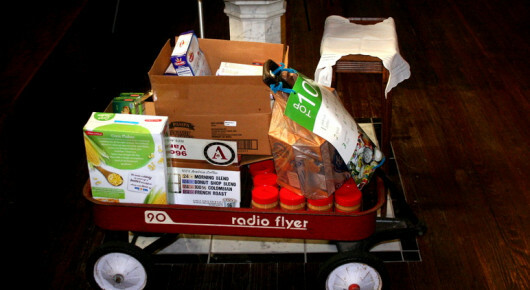 We contribute food monthly for the CLM Food Pantry. And we have monthly St Paul's OUTSIDE the Walls projects to meet other needs in the community. Built in 1893 by workmen from the Howard Steamboat works St Paul's is a lovely victorian style structure. 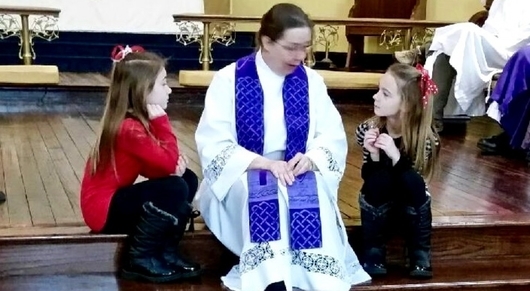 Bishop Jennifer made her first official visitation at St Paul's spending time to know us and this community. St Paul's is a diverse group of people who are willing to do the hard work of being an inviting, caring Christian community. We encourage people to participate in many ways in our worship. Our children are full and honored members of the congregation, as are our elders and all those in between. 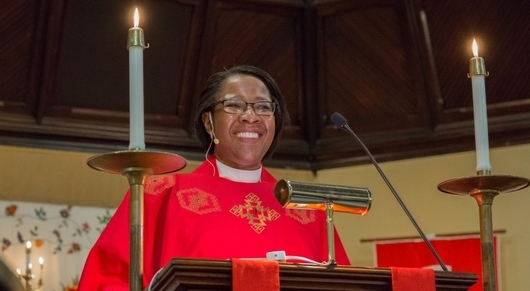 Our Bishop is the Rt Rev Jennifer Baskerville-Burrows Bishop of the Episcopal Diocese of Indianapolis. Thank you for visiting St Paul's website! 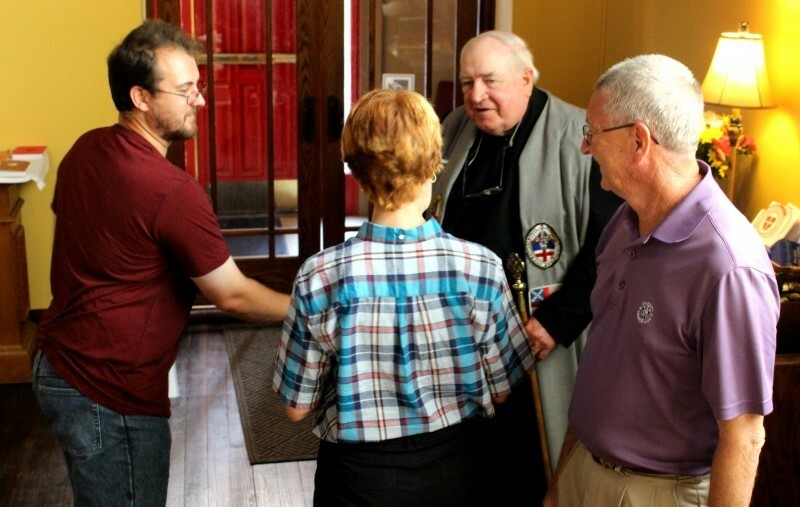 St Paul's Episcopal Church,in downtown Jeffersonville Indiana (across the Ohio River from Louisville KY) is a community of welcome, hospitality and acceptance. 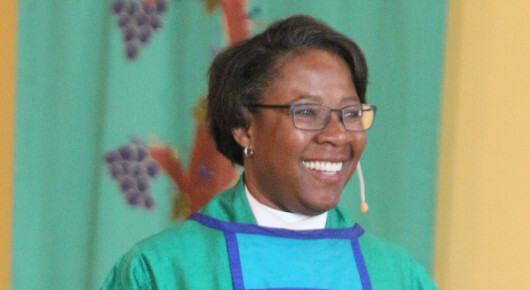 The people of St Paul’s Church, invite you to come gather with us, to rest in the Lord, to be sheltered under the inclusive branches of God’s love, and to live out the radical openness of God. 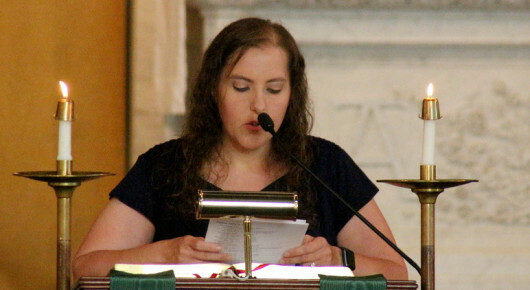 We gather on Sunday morning at 10:15 AM for worship. 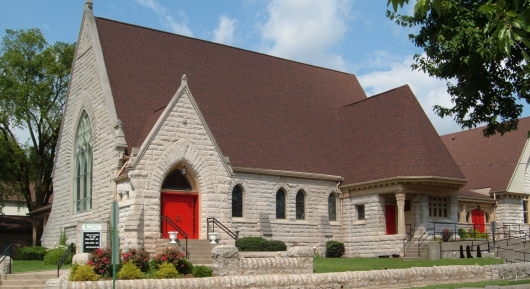 St. Paul’s, located at the corner of Walnut and East Market Streets in Jeffersonville IN, is an intergenerational congregation which values participation in worship. A coffee hour follows our service. We periodically have educational opportunities including book studies, examination of issues and topics relating our faith to our lives. to more fully become the people God created and calls us to be. We prepare a place for everyone around God’s table, believing that in St. Paul’s faith community all are valued and included in God’s kingdom. We see our purpose is to share God’s radical openness with others. We range in age from young children to 90+. 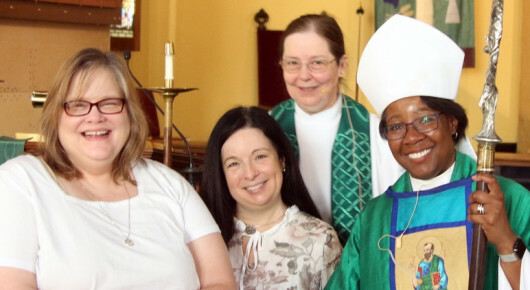 Some of us were born into the Episcopal Church. Most among us have come to this faith community more recently. Feel free to browse through the various areas of our website and learn about our fellowship. No matter where you are in your spiritual journey, or the questions you may have, St Paul’s invites you and offers you welcome. If you are looking for a worshipping community, or are relocating to our area, we would love to have you get to know us and to consider joining with us as compnaions on life's journey. Ministries to provide nurture for the spirit and tangible assistance to people in the community. or a friendship with Jesus. 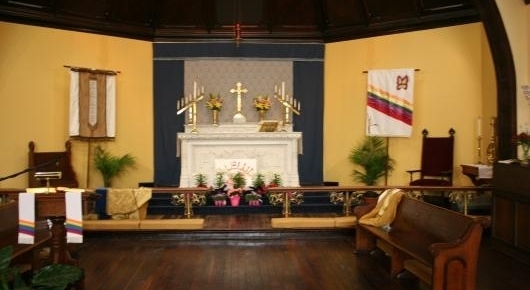 On Maundy Thursday we will offer the Liturgy for Maundy Thursday at 7pm with homily, the washing, comunion and the solemn stripping of the altar. At 5 pm on Good Firday we participate oin the Way of the Cross Walk in the downtown area. We begin at the Court House and do stations of the cross in various locations. At 7pm we offer the Litrgy for Good Friday with a dramatic reading of the Gospel, meditation and prayers. 10:15am Family Friendly Easter Service with children's chat, hymns and communion. On the first Sunday of the month at 9:25am we have a forum dealing with a Celtic Saint, ora topic related to our year long study of Celtic Spirituality. On the Third Sunday of the month the 9:25am Forum is led by Kevin Brown on The Celtic Way - detailing some aspect of the spirituality of these forbearers in the faith. 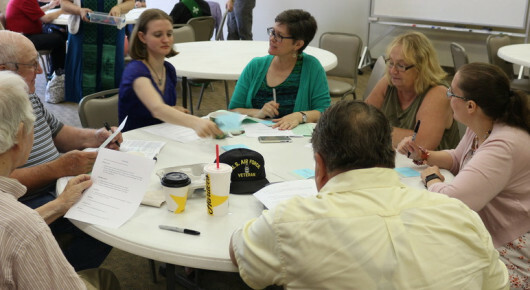 Our Forums are held in the Parish hall of St Paul's Church E Market at Walnut in downtown Jeffersonville. We invite you to join us.